New Zealand’s Damian McKenzie is the latest high-profile player to be ruled out of the 2019 World Cup in Japan. 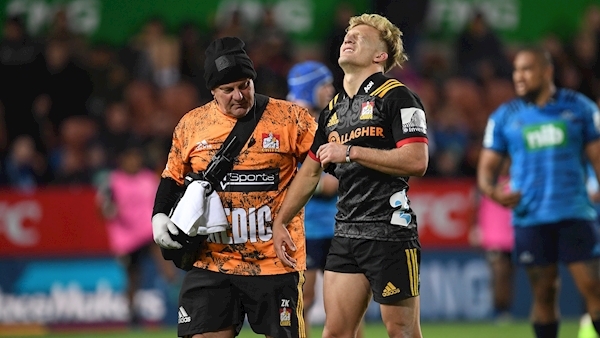 The 23-year-old full-back has been sidelined for up to nine months, after rupturing his anterior cruciate ligament while playing for the Chiefs in Super Rugby at the weekend. McKenzie has scored 12 tries and kicked 20 points from the tee during his 23 Test caps for the All Blacks. Head coach Steve Hansen said: “His World Cup opportunity is gone. He’ll still be young enough to make probably the next two. It comes two weeks after Ireland lost flanker Dan Leavy to a similar injury. GAA podcast: Cork SHC preview, Ilen shock. GAA’s hip injury epidemic?